Saxophone care and maintenance is obviously required to keep your axe from letting you down. You are only as good as your horn will allow you to be. (The same could be said of your reed.) Why do all this? Germs on mouthpiece cause illness. To prevent pad and cork damage: Saliva breaks down natural material, i.e. leather pads. But synthetic pad materials are not immune to decomposition either. To avoid repair costs: most repair techs start at $40 per hour. 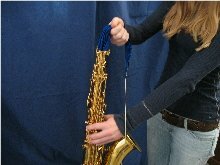 A typical sax repad is around $250.00. 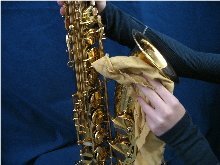 Sticky pads is a common enough problem experienced by saxophonists. The type of thorough cleaning described in the next two pages should be done once a month. The mouthpiece should be cleaned once a week, although I clean mine each time before I play. And if you are sick, I suggest washing it every day. 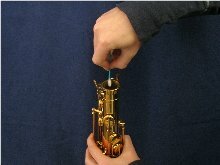 You can actually repeat an illness from playing on a mouthpiece not cleaned after you recovered. Trust me; been there-done that. Some of the supplies needed for saxophone care and maintenance can be found around the house; some can only be secured from a music store. 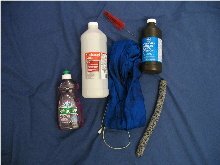 You will want to get a swab, polishing cloth, mouthpiece brush, Q-tips, alcohol, liquid dish soap, old cloth, vacuum cleaner, neck cleaner, and cork grease. Although there is no right or wrong order of steps to cleaning, you will want to develop some type of system for yourself so you do not forget anything. I work from the inside to out and from the bell to the neck. 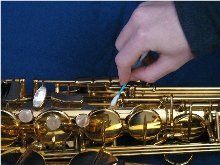 I start by washing the mouthpiece, and then I swab the inside of the saxophone. Then I work on the outside of the horn by cleaning the rods, keys, posts, and polishing the body. The last thing I do is vacuum the inside of the case. Use alcohol on Q-tips to clean the neck tenon and inside the receiver. Polish the body with a polishing cloth. Do not use a bathroom washcloth or a paper towel. Because of its material, weave, and thread count, you can scratch the finish. Do not use cleaners or chemicals. 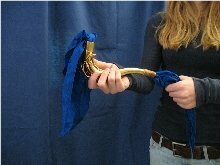 A brass lacquer polishing cloth is all that is needed.